The Bass Driver™ features three different bass overdrive distortion pedal models to select from. Go from a light overdrive to all out Stonerrock Fuzz or morph in between. 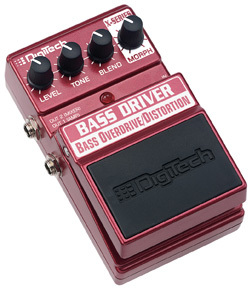 What frequencies does the Bass Driver Overdrive / Distortion pedal control? The tone knob in particular. What frequency does it effect? Also, Where is the distortion centered at frequency wise? The tone knob effects several frequencies. It is not a simple high shelf or parametric filter with a fixed frequency. It is composed of three filters with individual frequency centers that change whether the tone knob it set to cut or boost. When set to boost the tone knob effects frequencies from 1450 to 5000 and beyond, and when set to cut it effects 725 to 4000 and beyond. This is what we call "spectral contouring EQ." The filters are adjusted to give an optimal sound for boost and cut. The distortion isn't really "centered" around a particular frequency. 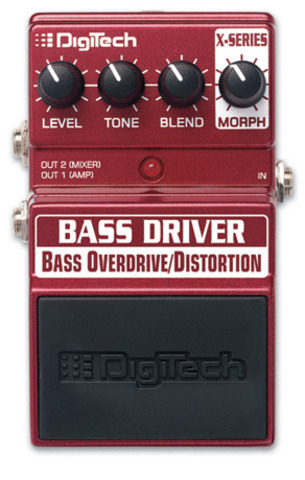 The amount of distortion is frequency dependent, but it changes with the setting of the morph knob. Generally the lows aren't distorted as much, but there isn't a particular frequency for how low the distortion goes. It mainly depends on the gain setting, and the setting of the morph knob.